Need Easy to Install Safe Outside Fairy Lighting? Big, bulky lights can be used to light up the outside, but they can be complex to fit, and very costly to run. Fairy Lights designed for outside can transform your backyard and garden easily. They are safe to use in different types of weather. Solar and battery powered, means that you don’t need to plug them in to mains. If you need some inspiration for how to use fairy lights to transform your backyard or garden, here are some simple light ideas to help you get started. If you spend a lot of time eating outside or are planning to have a garden party, a fairy light chandelier can make your garden stand out. Making an outdoor light chandelier is simple to do, and looks amazing. The first thing that you need is a hula hoop that you have wrapped in fabric or ribbon. Once you have your hula hoop cover, wrap the outdoor fairy lights around the hoop. Then attach a string, chain, or more ribbon, and hang it in your garden. Easily Install Fairy Lights for Christmas Time. Christmas fairy lights can add a sparkle to any home or outdoor space. They add a magical feeling whether indoors or out. If you are looking for a simple way to add lights to your yard, and a way to not need to hang Christmas lights, wrapping a tree with fairy lights is a great solution. Depending on the size of tree will affect the amount of fairy lights you will need. The best part is that when Christmas comes around you just need to change the settings, and your yard is decorated. Outdoor Lighting with Bottles and Fairy Lights. If you have a lot of parties at your home, you will most likely have glass bottles lying around. If you are looking to use them for something instead of throwing them out, turning them into lamps is a great idea. To do this empty out the pretty spirit or wine bottles, and remove the labels. Once the inside is dry, fill the bottle with our fairy lights. Once the lights are in the bottle, take the lamp outside, and find an area that could use the decor and the light. If you want amazing decor for garden parties, or to add to your Christmas light display, simply hang string lights from the trees in your yard makes it look magical. Make sure to hang each string of lights at a different level, as this creates more visual interest. 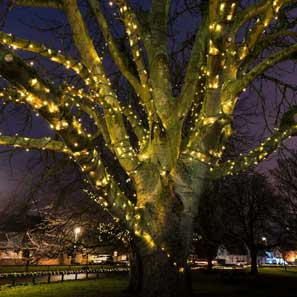 Fairy lights can be used in many, different ways to light up a garden or yard. Solar-powered and Battery Lights now come with timers and dusk sensors which means that you can use them for lighting without needing to remember to turn them on.